Project obstacles and solutions: The Bridgestone Arena in Nashville, Tennessee was the site of the 2013 CMA Awards. 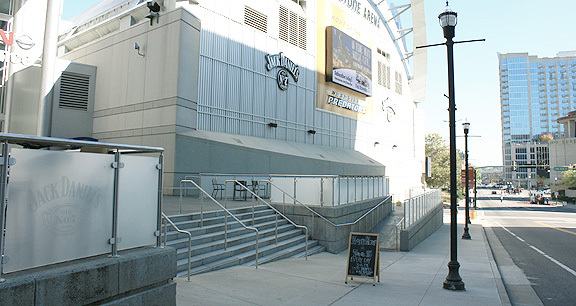 The entryway to the arena had undergone a renovation, with the addition of restaurants and outdoor seating areas. This area included landscaped retention walls, ramps and steps into the south entrance of the building. The steps were precast concrete and were dark gray. Reed Landscaping was contracted to design and pour a dark gray hardscape that had to match the steps. They turned to IMI for colored concrete options. Reed's design called for the use of a gray stone coarse aggregate in the retention walls that was mined in Georgia. IMI used an integral color mixed with the concrete to match the steps. After it was poured, it was treated with an etching compound to expose the stone. The flatwork of the entryway was designed with a Black Beauty Sand that was mined in Kentucky. This sand was used as the fine aggregates in the concrete. IMI introduced a black coloring agent, integrally mixed with the concrete. The ramp, walkways and dining areas were poured with this darker mix to contrast against the walls. IMI supplied 200 yards of concrete for the project. The biggest obstacle on this job was time. The project had to be completed for the CMA Awards on November 6. With 20,000 people expected to attend the ceremonies, the entryway had to be completed by the deadline. There was a delay in getting the aggregates that had been specified. Two weeks prior to the show, Reed Landscaping began pouring the project. IMI delivered concrete around the clock to help the contractor meet the deadline. The concrete was finished and opened one week prior to the event. For more information on colored concrete options, click here.